Henry Ford, Thomas Edison, Harvey Firestone, and John Burroughs were all good friends. In fact, they were known as the Four Vagabonds. Between 1915 and 1924 the four would go on seven camping trips for weeks at a time. Edison would plan each trip and he wouldn’t tell the others where they were headed until they met at the start of each trip. Henry Ford would retrofit Model-T’s and other vehicles with kitchen equipment, cold boxes, food, so they could comfortably enjoy their solitude. They would often invite other people whom they respected, even US Presidents, to join them. They would spend countless hours traveling, talking, and enjoying each other’s company before disbanding. These camping trips would end in 1924 because they began to attract too much attention which defeated their purpose. My Life and Work by Henry Ford is an exceptional look into the mind of one of the world’s greatest entrepreneurs. His impact on the transportation industry as well as other industries cannot be overstated. At the same time the automobile industry was ascending, so was the tire industry. Cars, trucks, tractors needed tires. Men and Rubber by Harvey Firestone is a look into the tire industry, and how he grew Firestone Tire and dominated the industry. Edison As I Know Him is Henry Ford’s tribute to his friend and mentor Thomas Edison. Henry Ford worked for Edison until 1899 (chief engineer at Edison Illuminating Company), and credits Edison for being the only person that gave him early encouragement to push forward developing an automobile with an internal combustion engine. 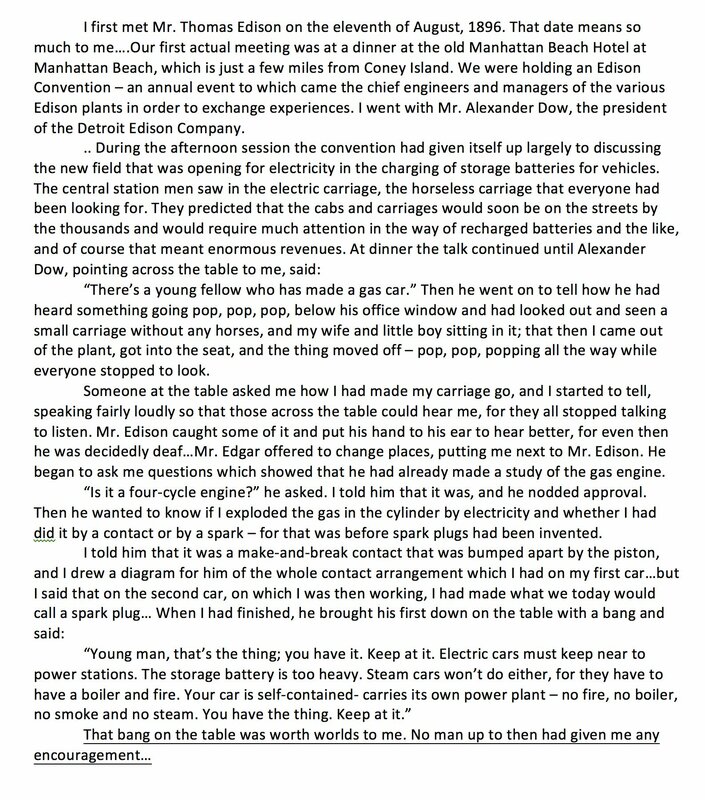 Here is a beautiful account by Henry Ford remembering his first encounter with Thomas Edison (source: Edison As I Know Him). Harvey Firestone, founder of Firestone Tire and Rubber Company, credits Henry Ford for much of his company’s success. Henry Ford would give Harvey Firestone his first major contract for tires that would catapult the company into dominance. In 1902, Firestone Tire had $150,000 in sales and grew to $115 million by 1920. In the fantastic book, Men And Rubber, he tells the story of starting and growing Firestone Tire, and also devotes several chapters to the camping trips he had with Ford, Edison, Burroughs, and others. You can understand why these men got a long so well because they had very similar business philosophies. They all believed in simplicity and driving down costs, even to the short-term detriment of their businesses. 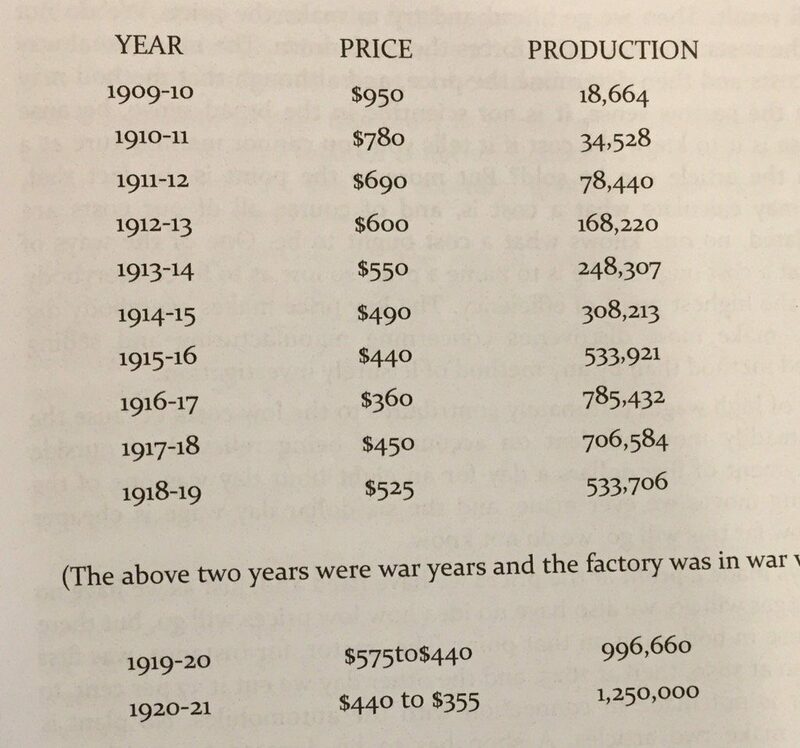 On a few occasions they would price the car (Henry Ford), light bulb (Edison), or tire (Firestone), lower than the cost of production to force the engineers to make changes to make it profitable at that lower price. When Edison invented the incandescent light bulb it cost his company $1.25 per bulb to manufacture. He sold them for $0.40 and took the loss because he knew that was the price it made economic sense for resellers and consumers. He took losses for four years before his cost to manufacture dropped to $0.22, and by that time millions were sold. His company was quickly bought out. He took short term pain for long term gain. Henry Ford said, “Our policy is to reduce the price, extend the operations, and improve the article. The reduction in price comes first…the low price makes everybody dig for profits”. I have covered 1% of these books usefulness above, so I hope I have helped seduce you to read these three books for yourself. You might be wondering what these books have to do with microcap investing. These men were intelligent fanatics. To find great companies early, you need to understand how greatness thinks. Fascinating. I look forward to reading the books. I love a small house, plain clothes, simple living. That is the simple life-direct and immediate contact with things, life with the false wrappings torn away. To see the fire that warms you, or better yet, to cut the wood that feeds the fire that warms you-to see the beams that are the stay of your four walls, and the timbers that uphold the roof that shelters you; to be in direct and personal contact with the sources of your material life; to find the air and the water exhilerating; to be refreshed by a morning walk or an evening saunter; to be thrilled by the stars at night; to be elated over a bird’s nest, or over a wild flower in spring-these are some of the rewards of the simple life. It is interesting that the group included him. Yes, it was quite a fascinating group. Luther Burbank would also join them on a couple trips. In one of the chapters in Firestone’s book he provides Burrough’s own writings on the observations on the trips and his thoughts on each person. If you’re not familiar with it, you may want to check out “Uncommon Friends- Life with Thomas Edison, Henry Ford, Harvey Firestone, Alexis Carrel & Charles Lindbergh,” (James Newton), a memoir written by a gentleman that knew them all personally. Thank you John. Last week I saw the book Uncommon Friends and purchased it. I look forward to reading it. Thanks Ian for mentioning these 3 books. Currently reading Henry Ford’s biography… it is much more than what I had expected. I’m glad you are enjoying the autobiography. It was easier to blend the three books together and tell it like a story then keep them separate. Thank you for the comment. I had to buy an old copy on Amazon. They aren’t easy to come by anymore.